Last edited by sonic1; 04-01-2019 at 09:35 PM. It is now one of the current backup *. nfi images are created in Flash. To use this function must be the plugin "dFlash" installed on the box of good mine! be downloaded to the PC. Upon request, then the backup on the box is cleared. The path for the backup on the box and will download to a PC and stored in the configuration are set automatically the next time. This command only starts the GUI, so Enigma (2) new. The ipkg / opkg packages can now be sorted by clicking on the column header. In addition to the previously selected entry will now jump back, if after you install or remove a plugin, the table is re-read. Reloading is necessary in any case, since DCC can not even detect whether dependent packages have been installed. These can also be translated into other languages​​. 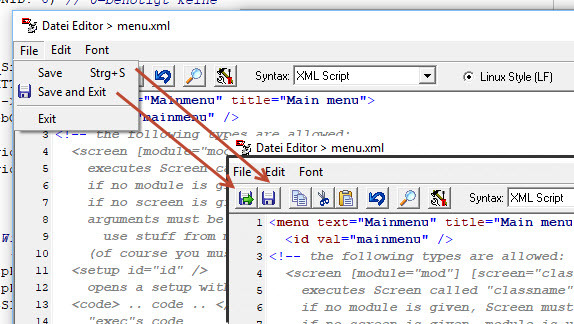 You can find these strings in the language file in the [strings] and start with 'menu ...'. Together with Recordings can each be associated *. ince downloaded optional. The setting is saved and automatically restored after restart. - If the query "delete file, are you sure?" terminated with Escape, the file was deleted anyway. The backup script has been taken from the current dFlash and should now continue with the previous order and will also work with the current version. The BA-detection has been adapted to the latest versions from 6.4.x. Previous versions are still supported. This task is no text-based changes in the resources, why should all language files of the previous version continue to be used. Last edited by sonic1; 01-07-2012 at 04:49 PM. Support OE2.0Functions with the problems OE2.0 had been revised so that they now work together with OE2.0 and also with the previous OE1.6. Please note that the status OE2.0 still "experimental" and thus has yet to incorporate changes that some functions may in turn call into question! Plugin management (tools / packages) completely revisedThe new plug-in management now also has a subdivision of the categories (types) that can be optionally selected via a combo box. The list now contains the name of the plugin as well as the short description. After double-clicking on an entry in an extended package information is displayed. 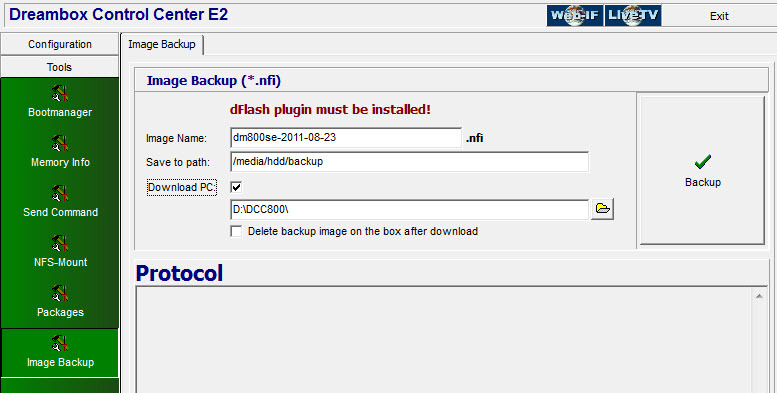 Support dFlash 06.02The backup script has been taken from the current dFlash 6.2 and should now continue with the previous order and will also work with the current version. Memory Info revisedTo display the mount point of the device name was added, as can otherwise arise when using some plugins (eg Rambo) multiple entries with the same mount point but with different device names .. Optional display of any box nameNow, any optional info text for example are shown as box-name behind the program title, if an entry manually to dcc.ini in the section "Network" is added, eg:[Network]Box Name = DM800-livingThis extension was made on explicit user request and should only be used if a multi-E2 DCC installed in different directories should be assigned to drive speakers. However, if the IP within a DCC-E2 changed occasionally, ausdrücklichempfohlen this option is not to use! Bug fixesTelnet: Fixed disappearing cursor on the bottom.LiveTV: Memory channel change and conflict to end the program fixed. Up to the package information, there were no changes in the text-based resources, why should all language files of the previous version continue to be used. Last edited by sonic1; 01-07-2012 at 04:50 PM. New Year - new version with some improvements. A further "service" port can now be defined in the profiles. Thus, the website of an installed plug-in can be called with its own web interface (eg for streaming or various services). The corresponding button in the header only appears if a port has been defined. If this function is not required - simply set the port to "0" or leave it. Optionally, DCC-E2 can now remember the last set FTP directory of each box and set it again when reconnecting. The last directory is stored in the respective profile of the box, so each box has its own last directory. If the option "Remember window size" is activated, the column widths in the FTP Commander are now also saved and restored automatically. So far there was only the possibility in the text editor "Save and quit ". Now there is also a function to "save" without leaving the editor. The file is written back in the background via FTP or stored locally. A dialog for "Settings" has been added to the editor. 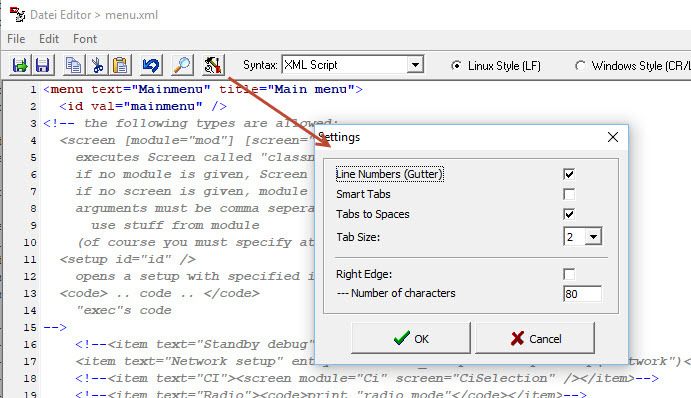 This allows further settings for the handling of tabs, line numbering and right marking line. The default settings are shown in the screenshot above. The previously fixed right marking line for 80 characters (gray line) can now optionally be switched on or off (default setting: Off). In the Commander, all files in the directory can be marked with Ctrl + A. The editor has now been extended with Windows usual shortcuts (eg Ctrl + S Save, Ctrl + F Find, Ctrl + Shift + F Find And Replace, Ctrl + C Copy, Ctrl + V Paste). 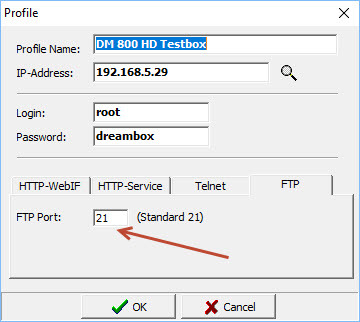 If the option for HTTP login was activated and the default browser of the system was used, the browser call was made with http: // name: pass @ ip-der-box. Since this procedure is not supported by Microsoft browsers (IE, Edge), the system browser is now generally called without authentication. This does not apply when using the internal browser, which will continue to authenticate automatically. A port change currently works only for FTP. port .. A change of the FTP / Telnet ports is not recommended anyway, instead I recommend to use a VPN access for external access. Looking for the latest version of STB Daemon.